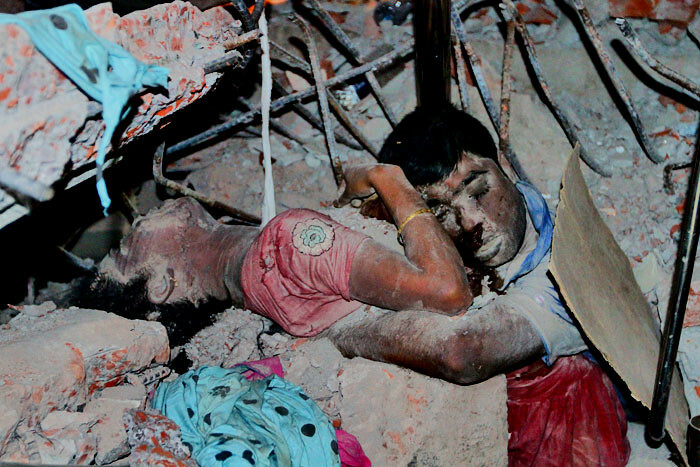 Rana Plaza, the building that collapsed in Dhaka, Bangladesh, on April 24, killing 1,127 workers—most of them young women—was constructed illegally. Bribes were paid to obtain building permits, and additional floors were added without permission. The day before it collapsed, workers on the third floor heard an explosion caused by the building starting to crack and rushed outside. An engineer brought to the factory was horrified by the cracks and said the building should be abandoned. But the owner insisted that work continue. Some may wish to call that event a horrendous accident. Bangladeshi garment workers—who have been protesting for years against slave wages, bosses cheating them out of hours worked, and abysmal working conditions—know that more was involved. Factory collapses like this, and murderous fires in other garment factories like one last November that killed 137 workers, recur with alarming regularity. Tentacles of responsibility stretch far: to the building and garment factory owners; to the Bangladesh Garment Manufacturers and Exporters Association, which complains about nationwide strikes known as hartals but does nothing about working conditions and wages; to the Bangladesh government and their “safety” inspectors who give factories and companies a pass time and time again; to the overseas companies like Tommy Hilfiger, Gap, Calvin Klein and H&M. Then there are the mass retailers including Target and Wal-Mart who proclaim the need for workers’ safety, yet do not insist on better conditions and salaries for the hundreds of thousands of workers in these deathtrap sweatshops. For all these parties, it is the bottom line that is the determinant—and thus the call for production and more production under horrid, unsafe working conditions and the cheapest salaries globally. The stakes are high. The Bangladeshi garment industry, the second largest after China, is a $19 billion prize and is the country’s major income earner. There are 5,000 garment factories employing 4.5 million workers, the vast majority of them women. The wages paid are the lowest in the world—$37 a month—up from $21 after huge worker protests. Worker resistance, a growing power, has been met with intimidation, strike-breaking, and outright murder of union organizers and activists. Unions, previously prohibited, are allowed now only on a limited basis; worker associations are allowed, but only in individual factories. The Industrial Police, a new government law enforcement agency, was created in response to the growing labor militancy of strikes and mass demonstrations. It collects intelligence and prevents labor actions. The government set up a Crisis Management Cell to watch over the garment sector. The main domestic spying agency, the National Security Intelligence Agency, spends time repressing union organizing and worker solidarity efforts. It is easy to show negligence and affix blame to this or that individual. But the greater truth lies within a system that is based on the most production at the lowest cost, with workers’ lives—and deaths—regarded as only one more cost of production. This entry was posted in Articles and tagged Bangladesh, Bangladesh textile industry, Calvin Klein, Dhaka, Gap, garment industry, labor, Occupational safety and health, Rana Plaza, sweatshops, Target, Tommy Hilfiger, Wal-Mart, Walmart, workers. Bookmark the permalink. ← School’s out! Where’s my next job?